One of my duties as my sister’s Maid of Honor was to give a toast during the reception. This is the draft of my toast I wrote up ahead of time as insurance against rambling or being dull. I think the actual toast I gave was funnier, but that could have just been because the audience had three hours of drinking under their belts by the time I started. This was a mistake because he should have known that I am not good at sharing my things. My. Baby sister. Pappa, you created a monster. That makes it rather appropriate that the first words Bobby heard from me went something like, “Hello, defiler of my sister’s virtue and chastity.” He was borrowing my sister, and I did not approve. That’s why he was really thrilled a few months later when he found out I was coming to visit her. “You do realize he’s not any taller than you, right?” I said after I met him the first time. She rolled her eyes and ignored me. Then another thing happened on that trip. We got back from being out doing something, and [Sister] ran into where Bobby was playing video games to say “Hi.” From the door, I watched as Bobby held the video game controller in one hand, then made eye contact, carried on a conversation, hugged, and kissed my sister, all without dying. When Jacqueline came back she kinda stared at me. “What’s that funny look on your face?” she asked. “I know you said smart people don’t get engaged while they’re in college,” Jacqueline said. “Of course I will. You’re my sister.” All mine. That girl right there in the white dress is my favorite person in the whole world. She is awesome and I love her and I am so, so proud of her. And now Bobby has married her, so that means I have to share with him. And he’s got two sisters who love Jacqueline too, and treat her really well, and I suppose I have to share with them. I still don’t share my things well, but if I have to share my sister, these are good people to do it with. Mildly threatening comments aside, Bobby, I approve of you, and I hope you two have a long, happy life together. 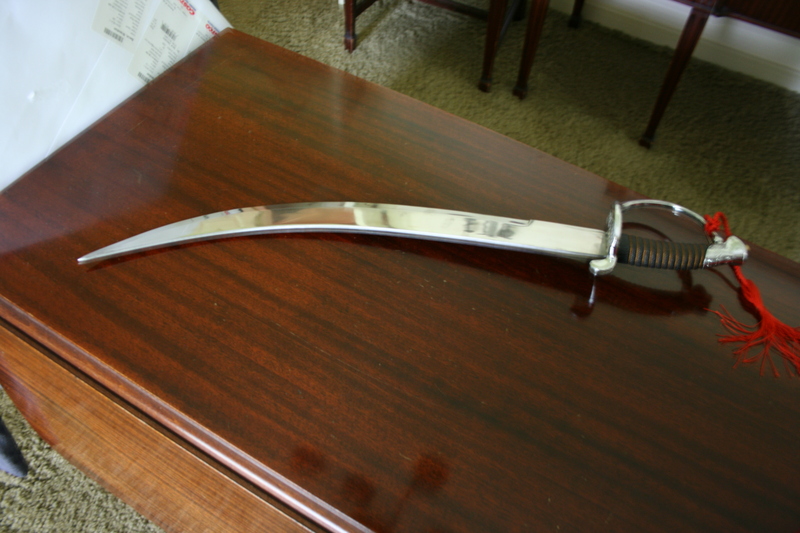 My willingness to publicly endorse my sister’s choice in spouse has nothing to do with the fact that they bribed me ahead of time by giving me a cutlass. I am so hanging that on my office wall once it gets here.